Daily writing is an essential discipline for aspiring authors, and prompts are an easy way to find some creative momentum while contributing to the completion of a longer work. Prompt Inspiration is the website I designed and operate to deliver daily, genre-specific writing prompts to authors and primary, secondary, and post-secondary instructors who incorporate writing exercises in their teaching practices. 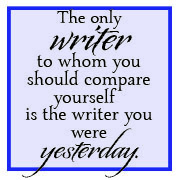 You can also find Prompt Inspiration on Twitter at @PI_writing and on Facebook at facebook.com/PromptInspiration.